Asalam o.alaikum. i dont have much to mention. 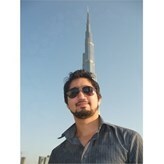 Just updated my progile as i dont live in dubai any more and no more a banker. I am in process to establish my own bussines here. My friends says about ne that I am a very loving. too much caring ... emotinaly inteligent. I would love to have a partner who cares and love. Want to live in peace with my loving partner. Making people smile. Enjoy alot my friends company. Islam is the best religon. I love every thing. She must be very caring , loving , respecting. If you really think i am the right person for you and you people are not looking for money but a real man and a good family.